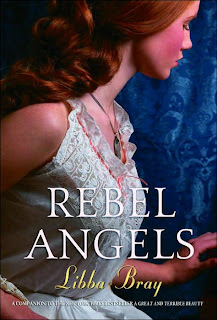 Gemma, heroine of Libba Bray's A Great and Terrible Beauty, returns in this sequel, Rebel Angels. I didn't reread the first one, but discussing it with Cool Motorcycle Dudette at work refreshed my memory enough that, along with the short recap of events at the beginning of the book, I didn't feel I was missing anything. I will do my best to review this book without any spoilers for either of the two books. The novel starts out at Spence Academy, the boarding school that was the setting for the first novel. Gemma has not returned to the realms since the end of the first book because she is afraid of what she will find there - and because she now realizes what is at stake. It is no longer a game, and events that happen in the realms can have tragic consequences in the "real" world. Her friends, Felicity and Ann, feel resentful because Gemma is the only one who has the magic that can open the door to the other realms. It is only in the realms that they experience power that is all too lacking in their lives as Victorian-era schoolgirls. A new teacher arrives, and there is something about her that doesn't seem quite right. Kartik, the handsome, mysterious Indian boy returns, telling Gemma that she must go back to the realms and bind the magic that has been set loose. The wild magic is dangerous because there are frightening creatures that can use it in dark ways - including breaking through the barrier between the worlds. We soon learn, however, that Kartik has his own agenda and orders from the Rakshana, which aren't necessarily to Gemma's benefit. During Christmas vacation the girls head to London for dances, theater outings, and teas - along with trips to the realms to search for the mysterious temple that is said to be the source of the magic Gemma must bind. 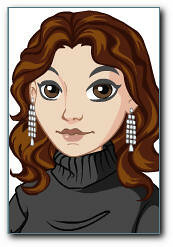 But Circe is determined to bind the magic for herself, and it appears she will do anything to achieve her ends. Gemma's search for the truth takes her to Bethlehem Hospital (otherwise known as the Bedlam insane asylum) and opium dens in the worst part of London, and along the way she meets handsome, imminently eligible Simon Middleton, who seems as attracted to her as she is to him. But what if he knew the truth about her, Gemma wonders? This was a suspenseful, exciting book, and the flowed seamlessly from the first one and gave greater insight into the characters. I did find it a rather stressful reading experience, though. Gemma was so alone, and she could never tell whom to trust. Even her closest friends had their own agendas, and I could never feel any faith that they would stick by her when it mattered. And Gemma made a bunch of really terrible decisions - things that in retrospect she would think, oh, that was stupid. But it wouldn't prevent her from making another stupid choice in the next chapter, and she just sort of blundered around throughout most of the book. It kept me on the edge of losing sympathy for her - any victories she had seemed almost to be by mistake. She was like the characters in the fairy tales that are told, whatever you do, don't do this or that, and she'd go right along and do it anyway. But still, I enjoyed the book and it had an exciting and satisfying ending. Sleep. Eat. Read: "Bray's writing is smart, funny, engaging and imaginative. A good mix of gothic suspense and whimsical imagination make Bray's books a great read." Yay, so glad you liked it. Only a few more months until the next one comes out in December! Yes - I forgot to mention that she left it very open for the next book. There's a conclusion, but lots of strings left dangling, too. I am very much looking forward to the next book! I have to admit, I just kind of skimmed your review. I went out and bought the first book about a week ago, but I'm not sure when I'm going to find the time to read it!! I have heard so MANY good things about it! I usually do that to the reviews about books that I already intend to read, too. I hate those spoilers. I try not to put any in my reviews, but sometimes it's hard to give a good idea about a book without telling something about it. I'll be looking for your review when you get around to it! Now HERE are some very cool bookstores!